Pact Coffee is a new online coffee delivery company, promising to deliver you freshly roasted (and ground) coffee as frequently as you need it. 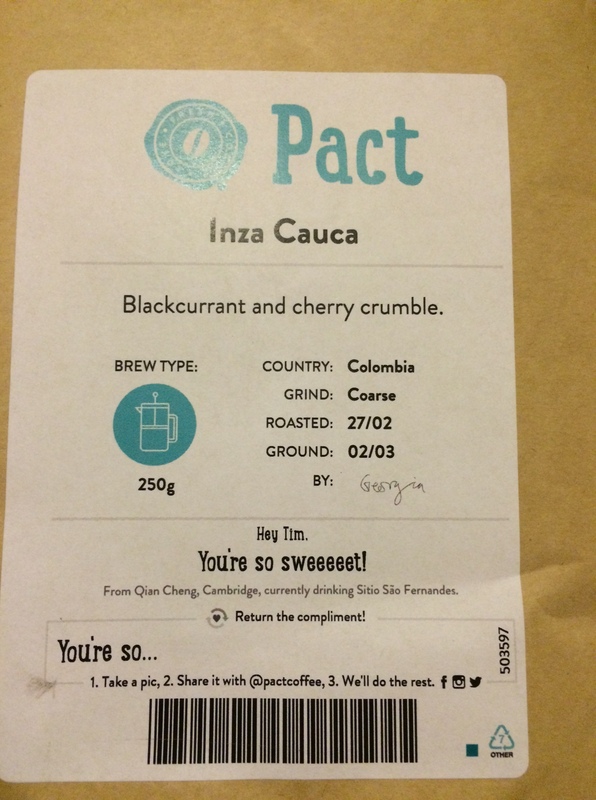 As we’re always very busy at Season’s Eatings, we’re always in need of some good, freshly brewed coffee, and as they deliver, we decided to check out Pact to see what their offering was like. Pact promise to send coffee that has been roasted at a maximum of 7 days before it is shipped out to you as well as grinding it (to match you cafetière, percolator etc.) at the last possible moment before shipping. We signed up for a weekend subscription, and were pleasantly surprised when a 250g packet of Colombian Inca Cauca coffee turned up the next day, coarsely ground for our cafetière, as ordered. Pact have taken all the hassle out of online order with their user-friendly interface. 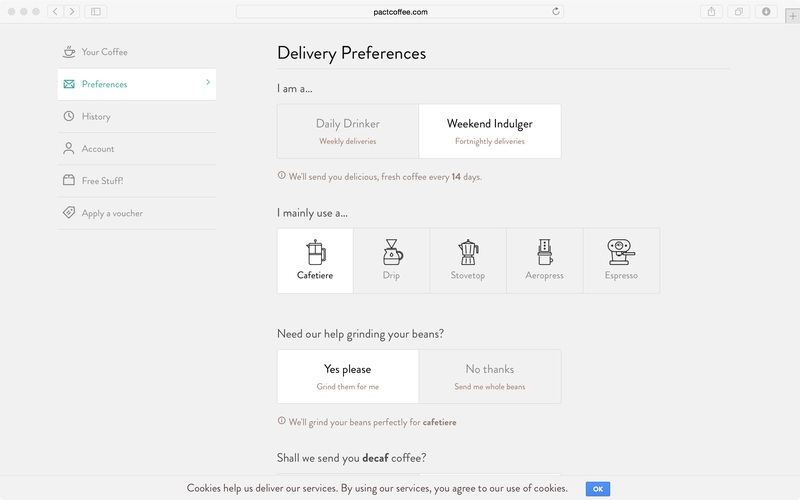 Also, something we appreciated is that as you’re not able to taste samples (this is an online business after all), Pact don’t expect you, the user, to know all their coffees as well as they do. You can specify a coffee if you know the one you want, else just describe how you like to drink it (again from their straight forward options e.g. “with milk yes/no”) and let them pick the best available option for you. The coffee itself was delicious, and although not coffee aficionados, we could taste the blackberry notes they mentioned on the packet. The packet is completely resealable, although we did transfer ours to our trusted coffee jar. We found the packet easily lasted 3 weekends of coffee between 2 of us, and then some. So for the £6.95 it is great value we thought, especially when you compare this against the supermarket bought coffee of a similar size in the £3-£4 price range, which is so often ground and roasted months before you actually use it. The subscription is as easy to manage as the ordering process – something our increasingly-tech-savvy grand parents could master with ease. Just log in to you account and you can change your preferences, let Pact know you’re on holiday (and need to put a pause on your account), or even cancel. We weren’t tied into any minimum orders and appreciate the ease and flexibility that Pact offer. Whilst we’ve been on holiday (and hence the delay on the publishing of this article), we’ve continued to receive a couple of emails informing us of our upcoming coffee choices being unavailable, which was a bit disconcerting at first, but this seems to be from an automated process rather than coffee actually arriving whilst we were away. 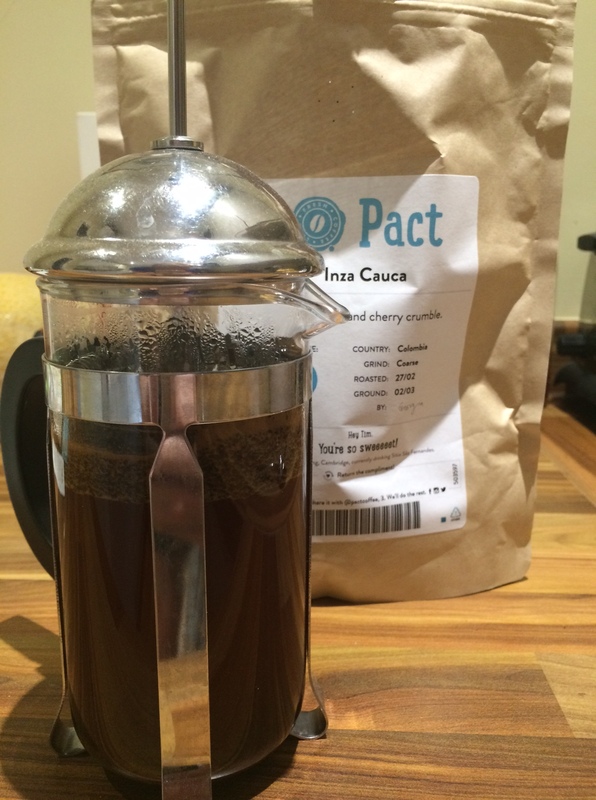 If you’d like to try out Pact for yourself, visit them online at http://www.pactcoffee.com. All coffee is priced at £6.95 and next day delivery is included.